Once in a while, a customer will come to us with questions about the type of mop to use on their brick tile floor. For the assiduous mopper, the typical sponge mop might not hold up to frequent scrubbing, especially on our more rustic tile styles, such as Wright’s Ferry. Trying to address this problem, we came across microfiber mops, a relatively new development in the floor cleaning sphere. Microfiber mops use static electricity to trap dust and dirt, allegedly getting floors cleaner with less effort. They also are much more durable than the typical sponge or loop mop. We were intrigued by the possibilities of this product and purchased a heavy-duty microfiber mop that could be used wet and dry to test out on our home’s brick tile floors. Read more about the product and our assessment of its usefulness below. This description of the product is from Shopmicrofiber.com, the website from which we purchased our mop kit. Microfiber mops are sold on many different websites– shop around for the best deals and features. The Microfiber Heavy-Duty Mop is a top-quality, industrial-strength alternative to our classic Microfiber Standard Mop. Specially built from sturdy, resilient aluminum hardware, it will easily stand up to continuous, intense use. Microfiber Mops are a safe and economical alternative to traditional mops because they provide a thorough clean using only water – no harsh or expensive chemicals needed. The microscopic, split, wedge-shaped fibers draw in and attract dirt and stains, leaving behind only a clean and sparkling floor. Microfiber Mop Wet and Dust Pads are machine washable at least 200 times, saving you money and saving the environment from needless disposable waste. Microfiber Mops are also easy to use, effortlessly surpassing all other types of floor mops. Microfiber is super absorbent, able to hold up to 7 times its weight in liquid, so mops won’t drip. Plus, they are lightweight and easy to maneuver, enabling you to cover large spaces in a short time. Because Microfiber is safe enough to use on any hard floor surface, including hardwood, tile, marble, linoleum, stone, and painted surfaces, it is ideal for every room in your home. Make a quick pass through the room with the Microfiber Dust Pad, quickly removing dirt, dust, hair and more. Then use the Microfiber Mop Wet Pad to wash floors for a bright, clean finish. Quickly clean up spills in the kitchen and bathroom, wipe away mud in your entryways, and more. 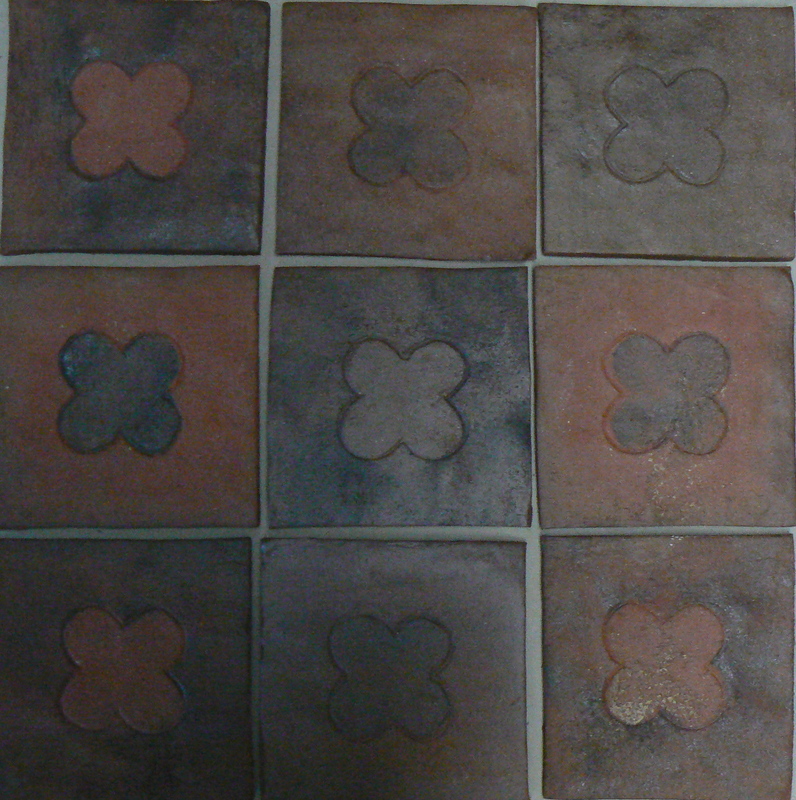 I first tried our microfiber mop dry on our most rustic floor– our entryway brick tiles are much more pitted than anything Inglenook Tile sells today, meaning its success on this floor would be a good measure of success on all others. The mop is very light and glided across the brick tile surface easily, not catching on any of the rugged grooves. As advertised it did, indeed, do an excellent job picking up the dirt and other small particles. The larger particles were left behind, however, indicating to me that the dry microfiber mop is best used for maintenance cleaning during the week with a thorough vacuuming on cleaning day. I removed the microfiber pad and shook it out well outside when I completed the floor, an action that seemed to restore it fairly well to its original pristine white state. Machine-washing is also an option. The next test, wet mopping. I used a warm, dilute solution of water and Stone Logix cleaner to wash our brick tile floors with the microfiber mop. Again, the mop worked well to pick up dirt and dust, leaving the floor with a pleasant, clean gleam. The logistics of using the mop were a bit complicated, however. First, my bucket could not accommodate the 18″ wide, rigid mop head, so I removed the microfiber pad (an easy task– it’s attached with Velcro), dipped it by hand into the warm cleaning water, wrung it out a bit, and then re-stuck it to the mop. All those familiar with mopping see the obvious problem here. Every time the mop needs to be rinsed and wrung as you mop the floor, the pad must be removed and the whole task done by hand. A specialized microfiber wringer bucket I have since located online has the potential to ellievate this troublesome part of the mopping process, though. One other complaint– the little metal slides that attached the mop head to the handle of the mop slid out of place several times when I moved the mop suddenly in one direction, leaving my mop in 2 pieces. I would then have to reassemble the unit; again, not a hard task but a somewhat annoying one. When I finished mopping, I did one final rinse with fresh water, wrung it out and hung it up to dry. No problems there. The hype about microfiber mops has merit. They are indeed excellent at catching dirt and very resilient to the texture of our brick floor. I doubt I will need to replace the microfiber pad for a long time. However, wetting and wringing out the microfiber pad by hand each time the pad needs to be rinsed is a daunting task. I will likely need to buy one of the microfiber mop wringer buckets before I undertake a major mopping project. If you are a frequent mopper and are concerned about a sponge mop on your brick tile floor, this is definitely the mop to buy. But do yourself a favor and buy a wringer bucket at the same time. Posted in Cleaning, Tiles, Tips and Advice and tagged Brick tile, brick veneer, Cleaning brick tile, Cleaning stone, cleaning tile, microfiber mop, Thin brick on August 25, 2008 by Inglenook Tile Design. As promised, here is the first of several cleaning reviews about products to clean unglazed tile and stone including our brick tiles. Today, I am writing about Stone Logix, an non-toxic floor cleanser formulated for natural stone. Don’t ruin your gorgeous natural stone floors with harsh cleaners! Protect your investment and use only a cutting-edge product like this that will not harm your fine stone floors. 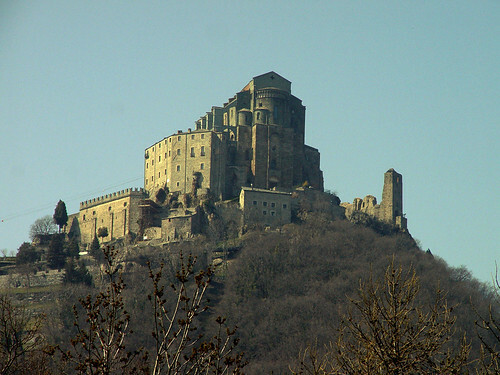 Stone Logix™ is safe for the environment and is an excellent cleaner! Gentle neutral pH. Safely cleans luxurious natural stone floors like marble, slate and travertine quickly and easily. The unique chemical blend breaks down oils, grime and dirt making it simple to mop away. 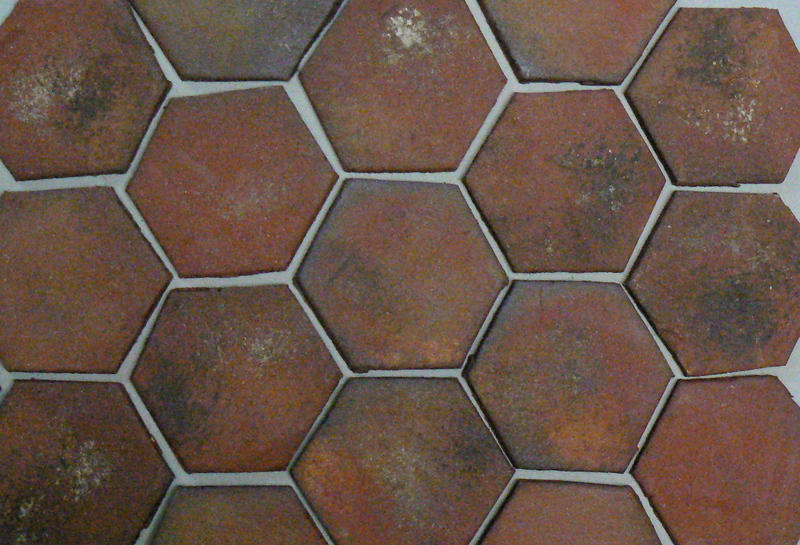 Restores and brightens tile and grout to its original color with oxygen power. The easiest and most cost effective way to clean! Contains NO acids, alcohol, amines, ammonia, caustics, chlorine bleach, Glycol Ethers, phosphates, dyes or perfumes. We used StoneLogix on a very dirty section of our brick tile flooring in the mudroom of our house (we live in the country, so the room at times actually does live up to its name). As we got the water ready we noticed that, despite its claims to being green and non-toxic, the product does still recommend wearing plastic gloves or other protection while cleaning your floor. Perhaps not completely benign, it would seem. We prepared the regular cleaning dilution: 2 ounces of cleaner in one gallon of water. Then, we scrubbed a section of the mudroom floor with a rag. 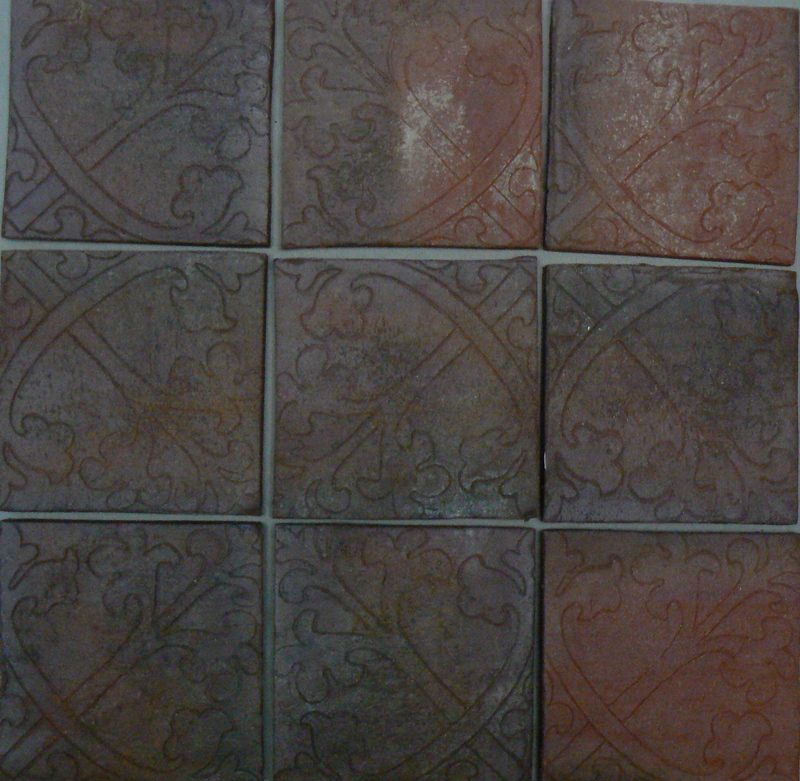 After allowing the tiles to dry, we noticed only a slight difference between the cleaned tiles and the dirty ones. Next step: try the stronger dilution. After all, this floor was quite dirty, the soiled floor dilution of 12 ounces in 1 gallon of water might be necessary. 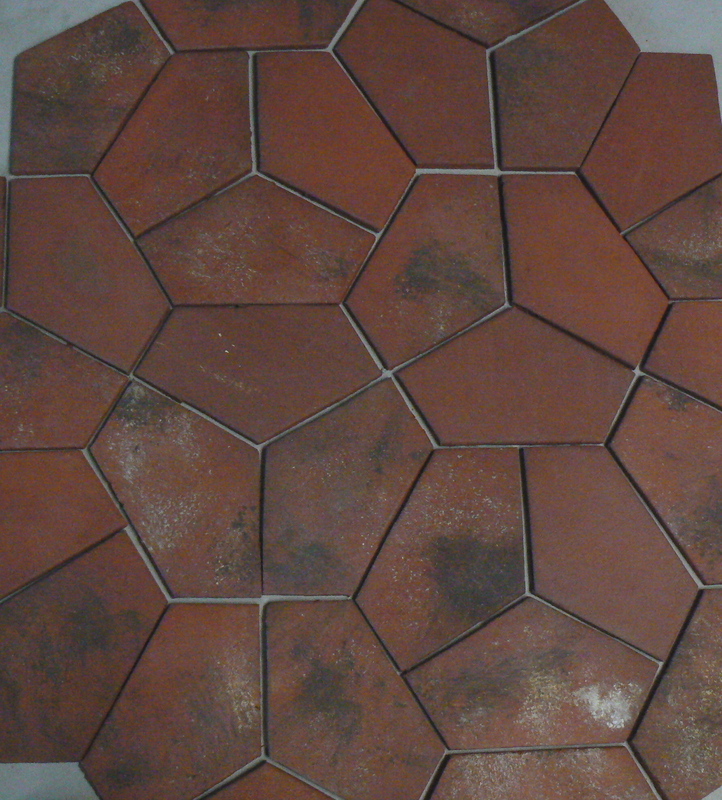 With the stronger dilution and some scrubbing, the tiles cleaned up nicely. Finally, we used the more dilute concentration of Stone Logix cleaner on another brick tile floor in our home, this one vacuumed and only somewhat dirty. We mopped up the floor with a microfiber mop (review coming soon) and the combination did an excellent job trapping any lingering dirt after vacuuming. Stone Logix cleaner requires you to use a high concentration and some elbow grease to clean heavily soiled floors, but it does work. For normal levels of dirt, the dilute concentration paired with a microfiber mop got our floor squeaky clean. The fact that it is non-toxic may also appeal to homes with small children or pets. Finally, this product can be used in auto-scrubbers, which makes it a potential pair with IRobot’s “Scooba” or an industrial quality auto-scrubber. Posted in Cleaning, Tips and Advice and tagged Brick tile, brick veneer, cleaning advice, Cleaning brick tile, Cleaning stone, Non-toxic Tile Cleaner, Stone Logix, Thin brick on August 21, 2008 by Inglenook Tile Design. Want samples or more information? Contact us. 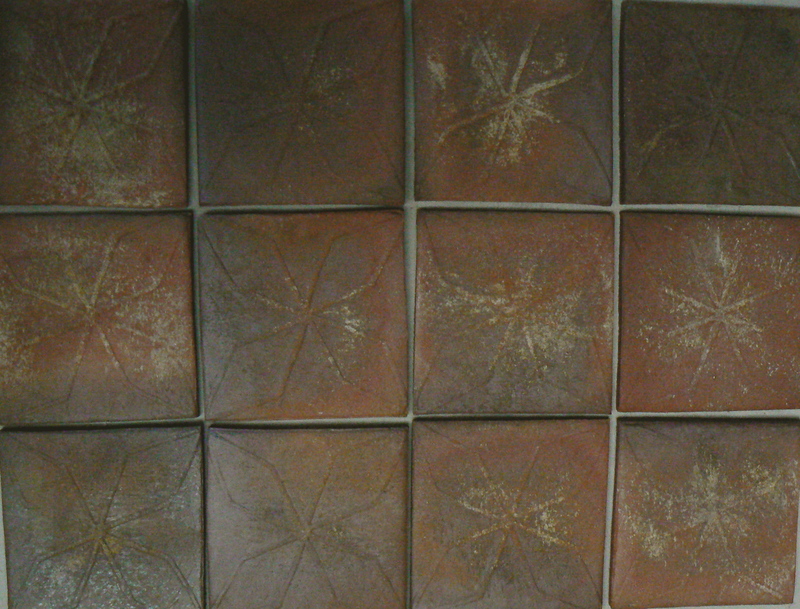 Old World collection tiles will be for sale starting this fall! 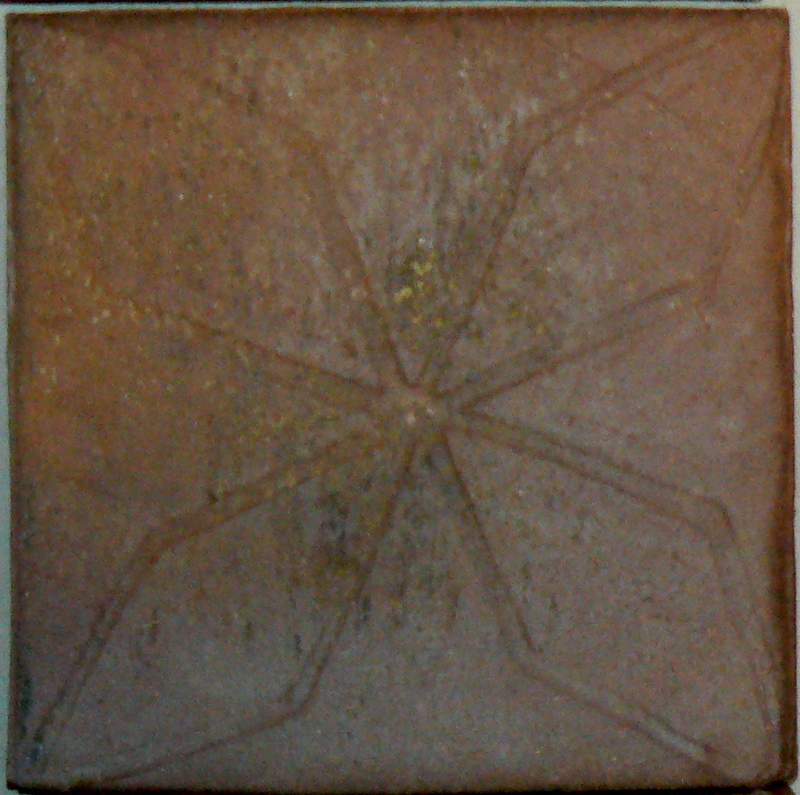 This plain mosaic design uses a single tile to create a visually-engaging pattern of nesting hexagons, subtle enough to be used on large swathes of floor, yet unique. Each broken hexagon piece is 9″ wide by 5.5″ tall, combining to form a 10 inch hexagon. As with all of our plain mosaics, the addition of powders, oxides and wood ash lend interest, variety, and age to each tile. A classic plain mosaic, repeating hexagons can be found paving public plazas and open air markets across Europe. 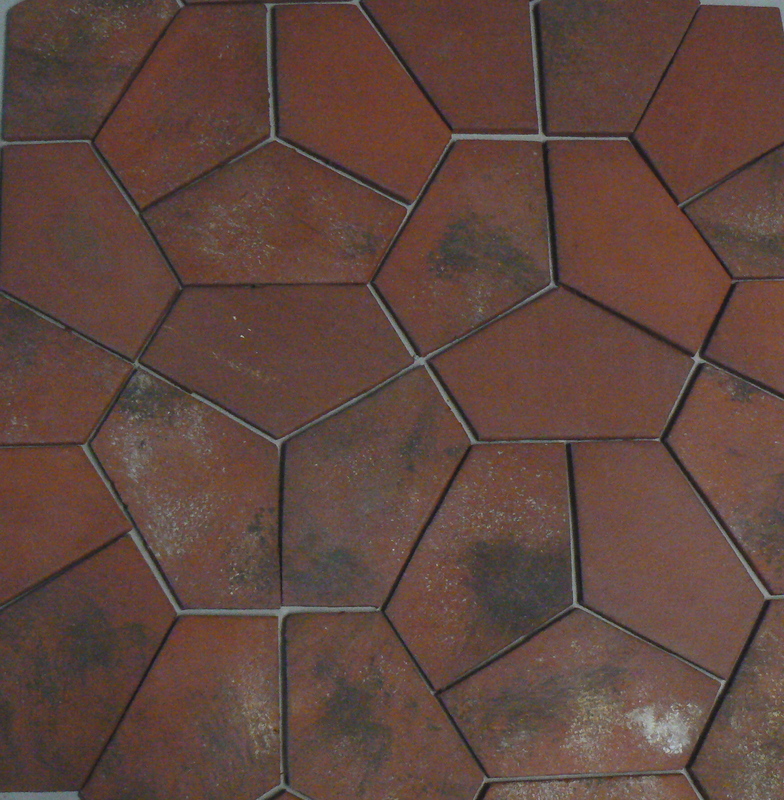 Our 5 inch hexagons bring the same appeal– simplicity and elegance– to your home’s floors and patios. 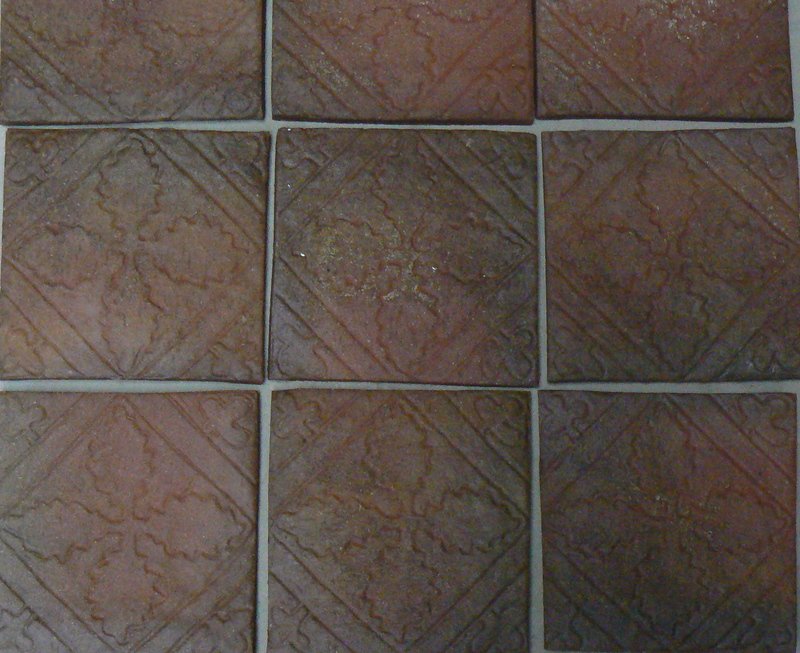 These tiles can be matched with our hand-stenciled designs from the Provence collection for a country French flair. Posted in New Products, Old World Collection, Plain mosaic tiles, Tiles and tagged hexagon tiles, historic flooring, Old World, plain mosaic on August 11, 2008 by Inglenook Tile Design.